Mini Hostel 'Au Petit chez Soi' is a nice place, in a strategic location, that offer you free WiFi, outdoor terrace, Reading Light, Restaurant ,Safe Deposit Box. In the heart of the village, close to all amenities, restaurants, bars, shops, beaches and port.Que ask better to integrate quickly in a village. You can forget about the car during the holidays if you wish. This area is close to the harbor and yet you are quiet, so there is the possibility to come and go to the beach, an ice cream, coffee and 'aperitif' on the port whenever you want without waste of time. Mini Hostel offer you 2 dormitories with bunk beds 3, 2 kitchens, 2 bathrooms (with toilets), 1 terrace courtyard with tables, chairs, umbrellas, Bed and bath kit provided (disposable kit), The port is 20 meters away and the beach 80 meters. You can go on foot to the creeks (20 minutes Port Miou). Truly a wonderful stay! I wish I had been able to stay longer. The best hostel experience I have had yet! 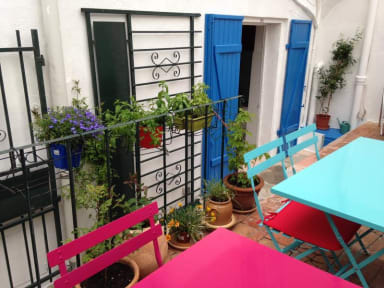 Great little hostel, perfectly situated close to the beach and everything. 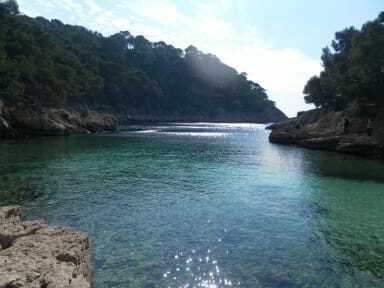 You can walk to the Calanques and do loads of other outings! Was great because as it's so small everyone talks and does things together! It was so much fun and totally worth it, not to mention Mimi is the most genuine, lovely and funny host you could have! What everyone says about the bells is true but it didnt once affect my sleeping. If you're a solo traveller this place is great! Excellent location in the heart of old town Cassis. Anne-Marie is lovely, energetic and knowledgeable about the area and top things to do. The facilities are all you need - small kitchen, cooker, clean bathroom and comfortable bed with fan for the summer. Coffee, tea and milk provided, as well as fresh bread and jams/butter. Easy walk to bus stop to take you to the train station and supermarkets are close by. Gorgeous area and enjoyed my stay a lot! Wonderful! Bright, cheery, clean and attentive. Wonderful time and would highly recommend. My daughter and I stayed. She is 26 I am 58 and we both felt comfortable here. Loved my stay here, super laid back and intimate hostel! Location is great in the centre of town, easy walk from the bus stop (shuttle bus runs from station into town). Anne-Marie the host is ace, gives lots of good tips for the calanques. Breakfast is a fresh baguettes and spreads every morning! Would definitely stay here again. The owners were extremely accommodating and the hostel itself is set up well. The town is beautiful! And of course the National Park is a must if you’re going to Cassis. Overall, highly recommended. Anne Marie is super friendly and willing to answer any questions! Great location and nice patio. The hostel can be cramped if there are more than 4 people in it because there is one bathroom and small kitchen. But would recommend for a night or two!! I had a really nice stay there for two nights. The other people in the six-bed-dorm were nice and quiet, everything was clean and lovely decorated. Breakfast was simple, with fresh bread, butter and some jam and could be eaten on the beautiful terrace. The location is really great, in a narrow street close to the haven. The church bells right outside are a bit annoying, but I could still sleep through the night. I met only 1 staff member, she was friendly and helpful. Great location and the staff are friendly and helpful when you arrive. Beds were comfortable but very basic. One toilet & shower to use between 6 people which is a bit tricky to manage in the morning when everyone is trying to get going, but there's a lovely little patio outside to sit and have breakfast so you won't be bored while you wait. Great value for money as it's a 5 minute walk to the harbor and 10 from the beautiful Cassis beach! Would definitely book here again.